By Karrar Haider in Photography. Updated on November 26, 2017 . Whether you run a food blog or looking to take some product photos, the best way to capture it is through overhead photography as it helps focus on what is important by removing the dimensions. However, it’s not easy to take photos from above at 90° angle, especially, if you’re looking to do some mobile photography. What you need is an overhead tripod that could take perfect photos from the top. Although the options are a bit limited when it comes to overhead tripods, I have managed to find 8 reliable ones. Some are dedicated overhead tripods for smartphones while other are customizable enough to work as one. Even if any of these options don’t attract you, I have some DIY ideas for smartfone overhead tripods as well. So, lets take a look. A cheap and reliable solution for overhead photography. 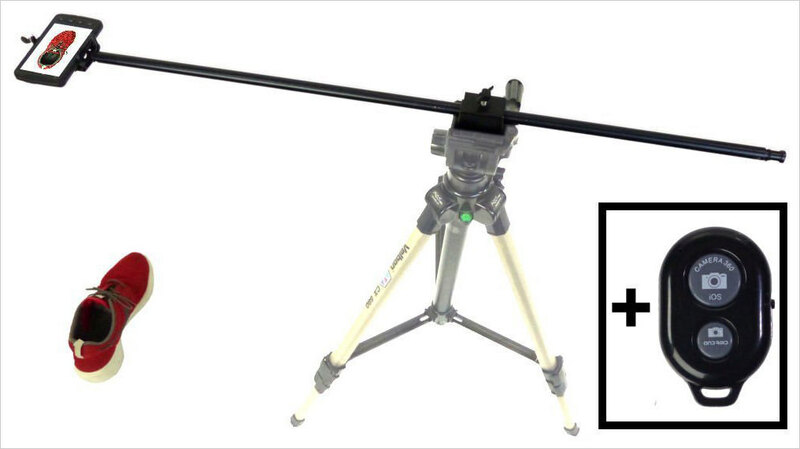 This is a tripod mount offered by ALZO that will easily attach to any of your tripods and let you take overhead photos. It has a sturdy smartphone mount that can handle all models of iPhone and most Android phones. The rod size is completely adjustable, and you can also rotate the smartphone both vertically and horizontally. Best of all, it comes with a wireless Bluetooth shutter to let you wirelessly control the camera, making it perfect solution for demonstration videos. Adjustable rod with horizontal and vertical mount support. Comes with wireless Bluetooth shutter. Doesn’t come with a tripod. Doesn’t come with a weight bag. Mingo LP-7M is not a tripod, but actually a tablet holder for easy viewing and handling. However, it is adjustable enough to handle both smartphones and tablets under 10-inch and the stand is flexible enough to do overhead photography. Although it’s not intended for overhead photography, but for such low price it gets the job done perfectly. 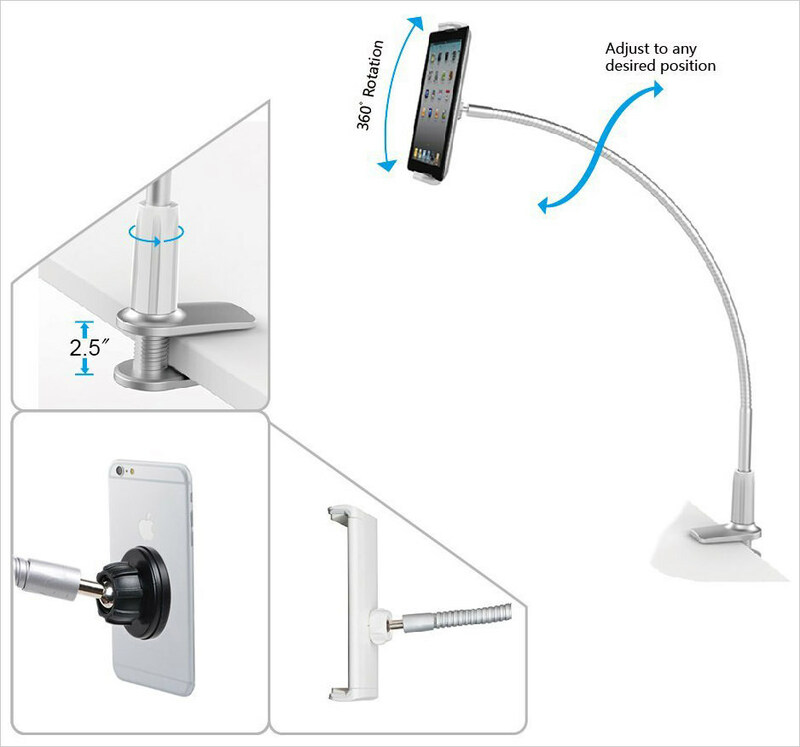 The smartphone mount is 360° adjustable and the standing rod is flexible as well, this allows you to adjust the holder in any way you like; even 90°. The stand firmly fixes to a 2.5-inch wide table and eliminates any need for a weight bag. Firmly fixes to surface, no weight bag needed. The arm is only 29-inches long, limiting the distance from the subject. This is actually a full kit for overhead smartphone photography. 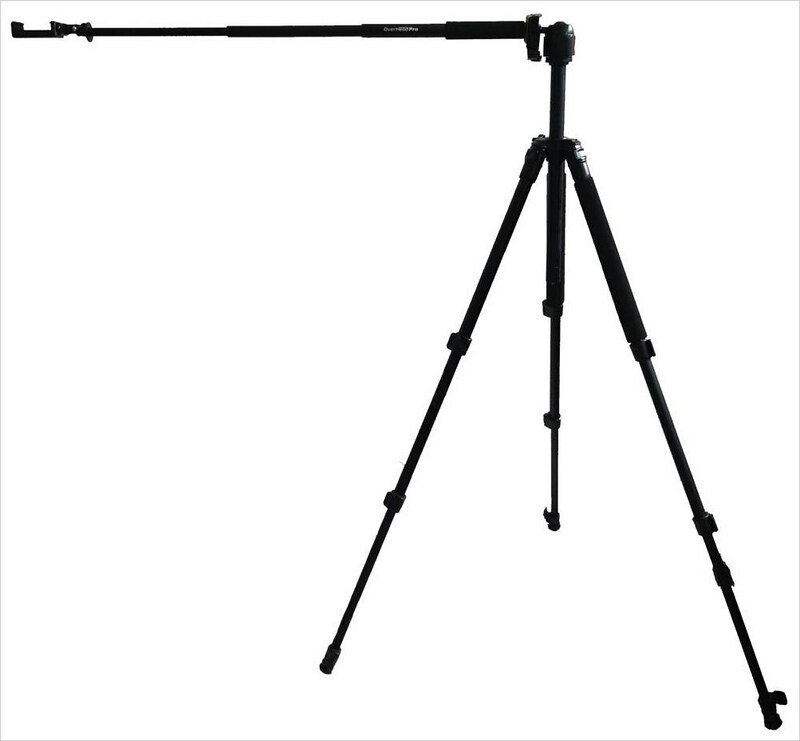 It comes with adjustable 3 leg tripod with a very long arm, which is also adjustable. 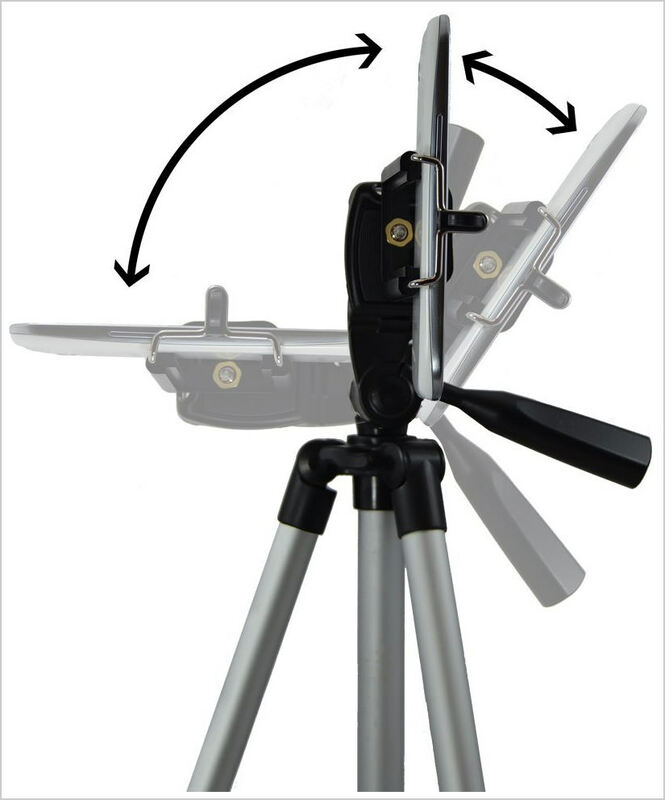 The tripod can go up to 5ft in height and the arm can be adjusted up to 3 ft. The smartphone mount works with all iPhone models and most Android phones, and can rotate in 360° to get the best angle. The tripod is especially created for travelling and has a hand grip for easy carrying and comes with carry case. Rubber legs to prevent slipping. Supports up to 150g smartphones. Doesn’t come with a weight bag for heavier phones, like Samsung Galaxy S8+. This is a complete tripod set with a smartphone mount for both overhead and eyelevel photography. 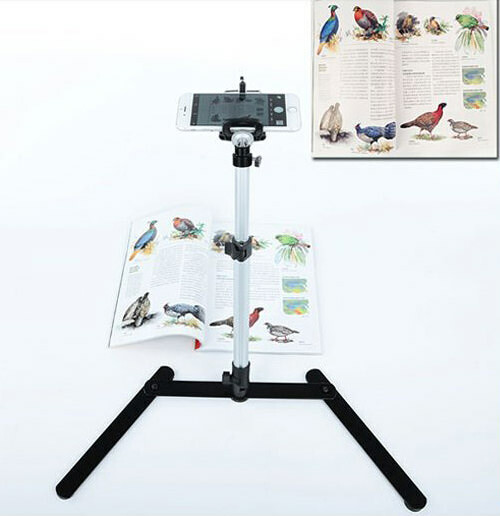 It’s dirt cheap at a price of $13.95 only, while offering everything you’ll need for smartphone overhead photography. So why is it so cheap you ask? Well, it’s built is very flimsy, hardly 1 pound in total weight. If you can carefully handle it and it’s able to bear the weight of your smartphone, then it’s probably a great choice. Although, it can extend up to 50-inches, but I doubt it will stand up for overhead photography at such height. Comes with both tripod and smartphone mount. The built is very cheap and requires extra care. A sturdy phone holder specifically created for making overhead videos. Even though it’s not specifically a tripod, but it does a fine job. The stand’s arm can extend to 12.5-inches and the height is adjustable to 29-inches. Although it has a square base, it provides enough balance to handle most Android phones and all of the iPhone models. You can attach phones (along with cases) up to 2 pounds and 4-inch wide. Can handle even the heaviest smartphones. The smartphone mount is 360° adjustable. The height of the stand and the length of the arm is a bit short. Another very cheap stand for overhead photography with smartphone. UTEBIT Copy Stand is made of metal but it is still a bit light and may tip over if you have a heavier smartphone. Although, it has flat legs that if needed can be fixed to a surface or put weight on to preventing tipping over. The stand is very easy to carry around due to foldable design, and you can adjust its height up to 18-inches. Cheap and reliable stand for overhead photography. May tip over if heavier smartphone is used. Stand height is a bit small. You can also create an overhead tripod stand yourself by using things usually found in your home and a few easy steps. Though you’ll still be required to get a smartphone mount, however, these are really cheap (you can find one under $10), like this Ulanzi Tripod Mount ($7.99). And, if you don’t want to buy a smartphone mount either, you can also create one yourself. A very cheap and easy to make PVC pipe overhead tripod where you can use some elbow, caps, and tee PVC pipes to create a reliable overhead tripod. 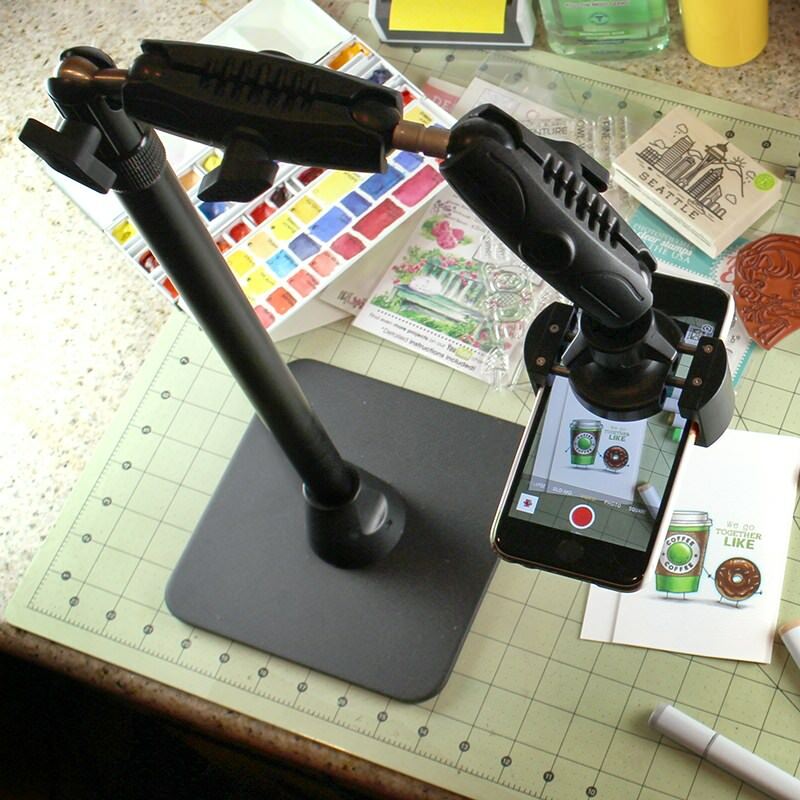 You will need to have smartphone mount to be able to attach to the DIY tripod. Okay this one has a bit limited use, but it’s probably the easiest and cheapest of all projects. You simply use large water bottle and cut an area to insert your smartphone. For weight, the author is using water but you can go for sand too. This simple DIY project only requires a box and a camera stick, or anything similar; like a broom stick. You need to cut a hole through the box and insert the stick with the smartphone on it, that’s it, you’re ready to shoot overhead videos. This is another PVC pipe overhead tripod project. However, this one doesn’t require you to have a dedicated smartphone mount. The author will create a mount right from the PVC pipes. You can further change the shape as you require. Overhead photography is great, but we have a limited set of tools to actually achieve it. If you just want to get things done, then I believe UTEBIT Copy Stand is a great option. It’s cheap and gets the job done. However, for overhead photography professionals, OverHead Smartphone Tripod Kit or Arkon Pro Phone Stand is a much better option.